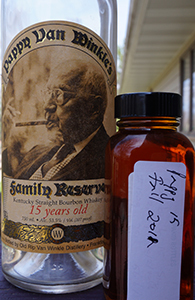 As you know, Pappy Van Winkle is known as the Green Spot of Kentucky. There’s something more than a little bit pointless about my reviewing this–does the world need yet another review of any Van Winkle whiskey? Probably not; but here we are. Let me begin by saying that I have placed this review in the category “Whisky by Distillery” because most people are likely to look there to see if I have any reviews of Van Winkle whiskies (assuming, of course, that anyone looks to see if I have reviews of anything). However, as there is no Van Winkle distillery, only a brand, this should really go under Van Winkle as a bottler. Who distilled the whiskey that was in the bottle my sample came from is also not clear. As per the source of my sample—who knows far, far more about American whiskey than I do—there’s not much more than strong conjecture/mythology about the provenance. 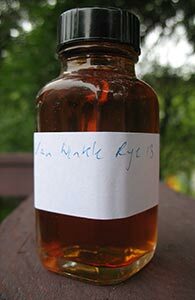 I don’t want to repeat things I don’t know for sure and so I will leave it to anyone who knows more to shed any clear light they may have on where Van Winkle Rye bottled in 2010 came from.